US President Donald Trump offered some backhanded praise for North Korean leader Kim Jong-Un, calling him “a pretty smart cookie” in a television interview that aired Sunday. Trump’s almost admiring remarks came amid soaring tensions with North Korea over its missile and nuclear programs, with an alarmed Washington looking to China for help in reining in Kim. Trump said he had “no idea” whether Kim was sane or not, but said the North Korean leader had faced a formidable challenge in taking over the country at a reported age of 27 after his father’s death in 2011. “A lot of people, I’m sure, tried to take that power away, whether it was his uncle or anybody else. And he was able to do it. “So obviously, he’s a pretty smart cookie,” he said. “But we have a situation that we just cannot let—we cannot let what’s been going on for a long period of years continue,” Trump added. 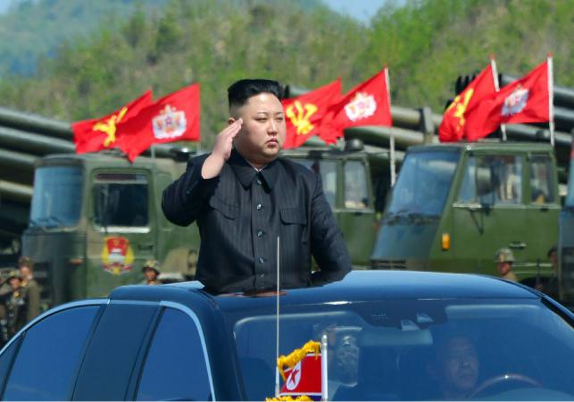 North Korea has kept the West on edge for weeks over signs it may conduct a sixth nuclear test, punctuated by a series of missile tests that have aroused US fears that the regime may be close to developing a ballistic missile capable of hitting the US mainland with a nuclear warhead. The North, defying mounting US pressure, launched its latest missile test on Saturday, which South Korea said failed. Trump refused comment on whether the United States had anything to do with the missile test failure. Hours before the North Korean test, US Secretary of State Rex Tillerson warned of “catastrophic consequences” if the international community does not act more forcefully to sanction Pyongyang. The United States has deployed a naval strike group to the area led by the carrier USS Carl Vinson, which on Saturday began drilling with the South Korean navy to practice procedures for tracking and intercepting enemy ballistic missiles. On Sunday, the two allies concluded a massive annual military exercise called “Foal Eagle,” which involved around 20,000 South Korean and 10,000 US troops. “And I can tell you also, I don’t believe that the president of China, who is a very respected man, will be happy either,” Trump said. So far, Trump has placed his biggest bet on getting China to use its leverage to pressure Pyongyang to change its behavior, a strategy that has failed to produce results in the past. Since meeting with China’s President Xi Jinping at his Mar-a-Lago estate in Florida April 6-7, Trump has set aside his campaign threats to impose tariffs on Chinese imports and declare Beijing a currency manipulator. “I think that, frankly, North Korea is maybe more important than trade. Trade is very important. But massive warfare with millions, potentially millions of people being killed? That, as we would say, trumps trade,” he told CBS. “Now, if China can help us with North Korea and can solve that problem—that’s worth making not as good a trade deal for the United States,” he said.